Exhibit included in admission fee. Admission fees: Adults - $6, Children (5-17) - $4. It is impossible to fully understand Wisconsin - its history, culture and prospects for the future - without an appreciation of water's power to create opportunities, influence decisions and shape the events that become our shared story. To experience and fully appreciate life in Wisconsin today, and to make decisions that will chart the course of our future, it is essential for Wisconsin residents and students to understand the historical role water played to shape our land, economy, culture and spirit. 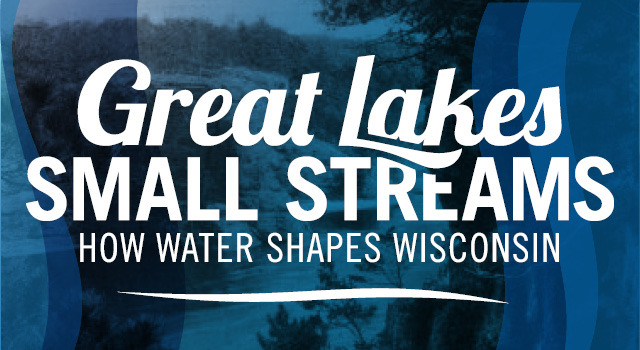 A water themed travelling exhibit from the Wisconsin Historical Society, "Great Lakes Small Streams: How Water Shapes Wisconsin," will be visiting middle schools, libraries, local historical societies, and nature centers around the state of Wisconsin. The exhibit will teach audiences about our relationship with water as a state. The exhibit will place many of our current concerns in a historical context and show how our state was changed over time by the force of water. Visitors will see the consequences—good and bad—of past decisions and will be challenged to incorporate insights they gain into actions that can secure a more hopeful future for all of us regarding water. The Wisconsin Historical Society gratefully acknowledges the Herzfeld Foundation, Wisconsin Humanities Council, and Ralph Evinrude Foundation for their generous support of this exhibit. The Little Chute Windmill is open Tuesday - Friday, 10am - 4pm; Saturday, noon - 4pm.